Caring for aquarium plants is as challenging as caring for the fish itself. The first and foremost basic need towards ensuring survival and propagation of aquarium plants is to have sufficient light, carbon dioxide and nutrients. Let us discuss towards fulfilling all the requirements. Basically light can be obtained using artificial lighting either from fluorescent tubes or metal halide depending on your budget and requirements. Fluorescent is the most commonly used aquarium lighting and they provide broad range of color spectrum from blue up to white and are mainly suitable for mini freshwater setup which is less demanding. However, if you intend to go for coral reefs and budget is not your constraint, it would be a better option if you decide to use metal halide instead because they produce the highest intensity of lighting with better quality in the blue end spectrum range. In other words, plants will grow better using halide. Carbon dioxide is another important consideration for ensuring healthy and vigorous plant growth. Basically carbon dioxide comes from natural respiration of the fish in the tank itself while further can be done to increase the concentration by introducing carbon dioxide through artificial means. One of the easiest setup is to use low pressure CO2 system that comes with regulators which you can be purchase from high-end local fish shop. The gas tanks are sold separately and usually the costs of purchasing and refilling the tanks are in the range of $20 -$30 per month depending on usage. 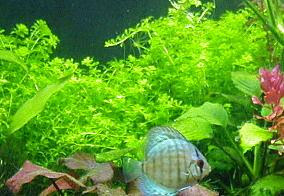 Aquarium plant nutrients can be divided into macro and micro nutrients. Basically a good aquarium fertilizer should contain the lowest amount of macro nutrients such as nitrates and phosphates while having the right proportion of micro nutrients, that include iron, copper and zinc. The reason is because macro nutrients are readily available generated from the decomposition of waste and left over food while the micro nutrients cannot be easily obtained directly from these source. Usually it is recommended to go for the liquid type and most important thing which you should take note before using fertilizers is try not to overdose because it can be lethal to the fish and will also promote unhealthy growth of algae. Just check and confirm on the recommended dosage before use.